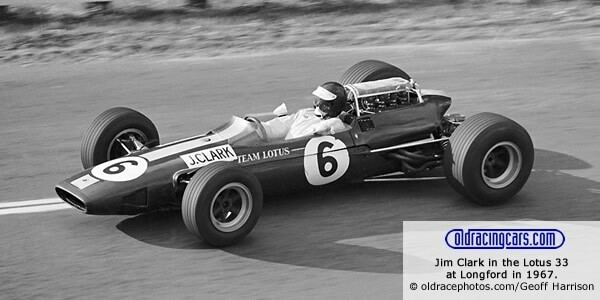 After the success BRM had achieved in 1966 with a 1.5-litre F1 car with enlarged engine, Jim Clark and Lotus tried the same approach and returned in 1967 with a Lotus 33 fitted with one of the very rare 2-litre Climax FWMV V8 engines. BRM hadn't rested on their laurels and had enlarged their P60 V8 engines from last season's 1930cc to 2070cc and had three BRM P261s on standby for Jackie Stewart and Richard Attwood. Completing the strongest line-up yet for the Tasman Cup, Jack Brabham was back for the full season with teammate Denny Hulme and a two-car team of Brabhams with full 2.5-litre Repco V8 engines. Stewart was very quick in his BRM but a series of gearbox failures left him with just two victories, ironically at the high-profile national Grands Prix. The Brabham-Repcos were also horribly unreliable although Jack was able to use his exra horsepower to dominate at the very fast Longford circuit. So that left Clark largely unchallenged as the Lotus-Climax finished every race and won five of them, including three that counted for points. Frank Gardner had the best of the local cars, Alec Mildren's ex-F2 Brabham BT16 with 2.5-litre Climax engine and tied for second in the title race after a string of third and fourth places. Kevin Bartlett also ran well in Mildren's second string Brabham BT11A and Leo Geoghegan finished an excellent second at Sandown in his ex-Clark Lotus 39-Climax. For more on the 1967 Tasman season, see '1967: Hulme, Stewart and Clark: Levin, New Zealand Tasman and beyond…' on Primotipo. 12 Feb 1967 > Lakeside "99"